Next in the series on New Braunfels Smokehouse is this Peppered Turkey Strips. See my previous reviews of their Peppered Pork Strips, Jalapeno, Sweet & Spicy, Teriyaki, and Peppered varieties. New Braunfels Smokehouse is a smokehouse and restaurant located in New Braunfels, TX. The company's history goes back to 1943, when it originally opened as an ice factory. The idea to create smoked meats came when local ranchers would keep their meats stored at their ice factory. An employee created smoked meats using his own family's recipe, and the result was a big hit with locals. From that the ice factory shifted gears and became a smokehouse. Turkey breast meat, water, salt, sugar, sodium nitrite. The first thing I taste from the surface of these pieces is a light smoky flavor, followed by a saltiness. Overall, a light surface flavor. The chewing flavor starts with a stronger saltiness, some natural meat flavors, and a faint peppery flavor. For being dubbed "Peppered Turkey Strips", there is a black pepper flavor but it's a light flavor on much of these strips. However, I did find a couple of strips where the pepper flavor was stronger. But overall, there seemed to more lighter flavored strips than stronger ones. There are some natural turkey meat flavors to taste in this, but they too are a light flavor. Otherwise, I'd say the saltiness is the most noticeable flavor, being more consistent than the pepper. 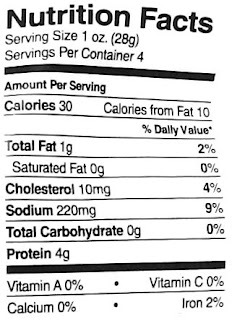 It seems to be at a moderate flavor intensity, though the nutrition facts label shows a lower sodium content. But again, the overall flavor of this jerky is light enough that it makes the saltiness seem higher than it really is. 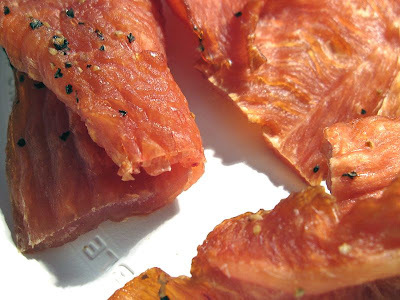 Overall, it's a pretty simple tasting jerky, where moderate-level saltiness is the primary flavor, with a smoky turkey meat flavor and a light peppery flavor sitting behind that. These are slices of whole meat, sliced to a medium thickness, and in medium sized pieces. 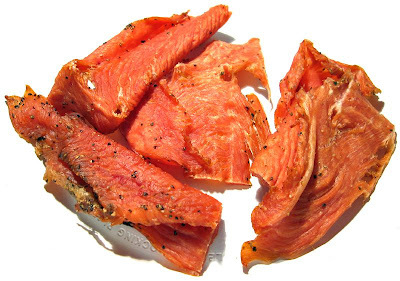 This is a dry jerky, having a dry feel on the surface, with just a little bit of flexibility. Tearing pieces apart with my fingers is fairly easy by just bending a piece back and forth. Chewing is somewhat easy. The chewing texture starts out feeling like hard rubber. After several chews it breaks down, and seems to chew down to a soft mass in about 15 seconds. At that point, it feels very much like dry turkey breast, very fibrous. In terms of fat content, I found just one piece with a significant streak of turkey fat on the edge. Another piece had a long strip of leg ligament that I could not chew through. Yet another piece had a reddish colored vein with some blood stuck to the meat. Aside from that, the other pieces looked quite lean. But it's pretty clean eating, it left no residue or sticky stuff on my fingers, and I found only a few specks of black pepper here and there on my lap. New Braunfels Smokehouse sells this Peppered Turkey Strips from its website at a price of $9.50 for a 4oz package. However, I purchased this through their "Jerky Sampler" which gets me six 4oz packages, each a different variety, at a price of $43.95. Add to that shipping costs of $12.95, and it comes to a total of $56.90. That's a per ounce price of $2.37. For general jerky snacking purposes, at the $2.37 price per ounce, this seems to provide a weak value. I don't get much snackability from this largely because it offers a light flavor complexity, and had a ligament and bloody vein on some pieces, though it seems to chew like real turkey breast. That $2.37 price per ounce is quite a bit higher than mass-market jerky you'll find in grocery stores, yet I'm not getting any better snackability. As a Peppered Turkey Strips, at the same $2.37 price per ounce, it's seems to provide a fair value. I do get some natural turkey meat flavors and it does offer a chewing texture much like turkey breast meat. But this jerky overall still provides a light, simple flavor that doesn't really inspire me. 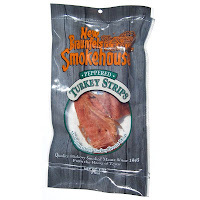 These Peppered Turkey Strips from New Braunfels Smokehouse has a light flavor complexity, offering largely a salty flavor, with just light amounts of smoky turkey meat flavor and black pepper. And that's about it. I think it lives up to its billing as "Peppered Turkey Strips", but doesn't provide any other flavor interest. For that matter, it was hard to find much snackability in this. While it seems easy to tear apart, and somewhat easy to chew, it was rather dry, feeling like eating a dry piece of turkey breast. I kept wanting dip this jerky into some gravy. For the most part however, it's very lean jerky, just three pieces worth mentioning, one with a significant streak of fat, another with a whole leg ligament, and one with a bloody vein that had leaked over the meat. For my recommended beer pairing, I think a wheat beer, or hefeweizen might be nice.